As the United States and Cuba moved this week to end more than 50 years of diplomatic conflict, public support for re-establishing relations with Cuba has increased. 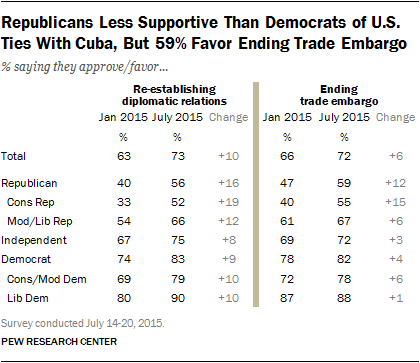 There is equally broad, and growing, support for ending the U.S. trade embargo against Cuba. In addition, a separate survey released today finds that the publics of several Latin American nations also view renewed U.S.-Cuba relations favorably. The share saying a thaw in U.S.-Cuba relations will lead to increased democracy in Cuba also has risen, though fewer than half (43%) say they expect Cuba to become more democratic over the next several years. 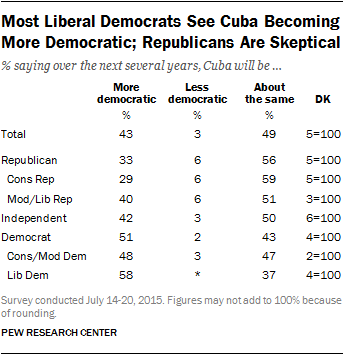 Still, in January just 32% predicted that Cuba would become more democratic. The latest Pew Research Center survey, conducted July 14-20, 2015 among 2,002 adults, finds that support for renewed U.S. diplomatic relations with Cuba has increased across nearly all partisan groups since January. Currently, 56% of Republicans say they approve of the U.S. re-establishing diplomatic relations with Cuba, up 16 percentage points since January. Larger majorities of Democrats (83%) and independents (75%) favor renewed diplomatic relations with Cuba, up nine and eight percentage points, respectively, since then. There has been a similar shift across party lines in support for ending the U.S. trade embargo against Cuba. Notably, some of the most dramatic change in views of U.S. relations with Cuba has come among conservative Republicans. Currently, 55% of conservative Republicans say they favor ending the U.S. trade embargo against Cuba; in January, just 40% supported the United States dropping its trade embargo against Cuba. And 52% of conservative Republicans now say they approve of the U.S. re-establishing diplomatic relations with Cuba, up 19 points since January. 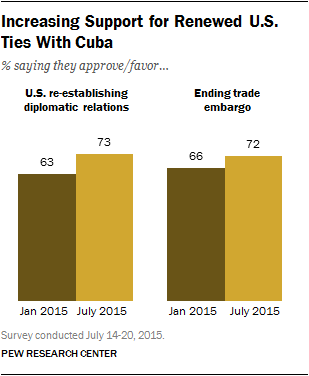 Support for restoring diplomatic ties with Cuba, and ending the embargo, spans virtually all groups in the population. And since January, increasing shares across most demographic groups favor both of actions. Overall, the public remains skeptical about the prospects of Cuba shifting in a democratic direction but more (43%) say they think the communist country will become more democratic over the next several years than did so in January (32%). 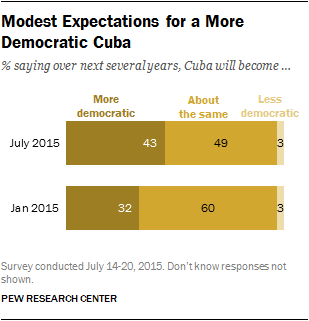 About half (49%) say they expect Cuba to stay about the same as it is now. Among Democrats, there is increasing optimism that Cuba will become more democratic over the next several years: 51% of Democrats say this now, compared with just 41% in January. Republicans are also slightly more likely to predict that Cuba will become more democratic; still, just a third (33%) express this view. Nearly six-in-ten liberal Democrats (58%) say that Cuba will become more democratic over the next several years, compared with just 29% of conservative Republicans who say the same.